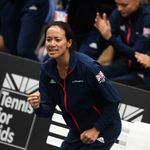 Great Britain Fed Cup captain Anne Keothavong is hoping for another home tie when the World Group II play-off draw is made on Tuesday. Britain booked their place in April’s tie thanks to a drama-filled Europe/Africa Zone Group 1 play-off win over Serbia on Saturday. Johanna Konta recovered from collapsing midway through her singles match with Aleksandra Krunic to seal a 2-0 win in the best-of-three encounter after Katie Boulter had put GB 1-0 up. Konta, who said she had an out-of-body experience, spent over ten hours on court over the space of the tournament at the University of Bath as she and Boulter both won all of their singles matches. Part of their success was down to the partisan support in what was Britain’s first home Fed Cup tie since 1993. April’s event will be their fifth World Group II play-off since 2012 and the previous four ties have all been away from home. Having seen what difference a home tie can make, Keothavong is hoping the draw is kind. “I mean surely the odds now…” the captain said. “It makes a huge difference. “Weeks like this no one will forget, and it makes a huge difference. “We do deserve a home tie. The girls deserve it, that’s what they want, I don’t care who we’re up against. With Konta and Boulter both producing the goods across the week in testing circumstances, Konta hopes it will stand them in good stead, whoever they draw in the next stage. “I think it has got as good a chance as every other team we have had,” she said of the team. “We have always done well with the team we have produced. “To be honest, we haven’t had the opportunity to come through yet. This team is prepared and after a battle like this, it can only draw from the experience.